UNITED ARAB EMIRATES–The “subtly” named “World Government Summit,” which started Feb. 12 and ran through Feb. 14 in Abu Dubai, United Arab Emirates, included a few Bilderberg Group and World Economic Forum (WEF) members, such as WEF founder Klaus Schwab and frequent Bilderberg attendee Christine Lagarde, longtime International Monetary Fund chief. But with Arab officials comprising perhaps half of the attendees, the pedigree of this much-lesser-known annual summit differs significantly from the Bilderberg-WEF axis and its North American-European complexion. An overriding fixation on world rule, though, is the irreducible shared goal. The annual Bilderberg meeting involves a mere 140 high-flyers from finance ministries, banking, royalty, parliament, the technology sector, select silent media, etc. Bilderberg’s anonymous press department issues one sketchy annual press release and produces zero video footage of its speeches and proceedings. But with 90 speakers and 4,000 attendees from 130 countries, the Dubai summit, much like the WEF, is a larger and basically open forum that’s broadcast worldwide via summit organizers’ You Tube channel and official website. Still, it’s hard to get past the Dubai summit’s name, which is yet another admission from the smug one-worlders who tend to run things that “world government”—long portrayed as a fantasy entertained by those unstable souls who inhabit the “conspiracy theory” realm—is for real, although there’s ongoing debate as to whether a world government has been fully consummated. Some have long believed that a world government would be, overall, beneficial to air, water, soil and humanity. Some of these world governance proponents, however, admit that globalization’s popularity is waning. But others, such as most alternative media commentators and a growing number of citizens, believe that a world super-state brings with it the aphrodisiac of too much money, power and control, and so the only way to prevent the abuses of a world super-state is to never allow such a state to come to full fruition, especially under a financial system rigged to benefit the plutocratic few—a tsunami of money and credit for the top tier and a money drought for the rest—caused by inherent defects in an overly centralized monetary system that needs to be changed into a more democratic model. For instance, engineer and economic visionary Clifford H. Douglas, some 100 years ago, released key books, including “Economic Democracy,” that outlined a dramatic, workable and humane departure from the enthralling modern monetary system which holds everyone in its deceptive grip — much like the golden ring in Tolkien’s “Lord of the Rings” — ensuring that the world, unless this corrupt economic system is abolished, will always have tyrants who will inherit or sell their souls to this system, thereby guaranteeing that the world will remain in its current condition of pending world tyranny where the many serve the few. (Also see www.socred.org). For starters, the Dubai summit’s website is littered with quotes from this and that attendee that seek to inspire—but often carry ambiguous meanings with a rather negative aftertaste. For example, Sheikh Nahyan bin Mubarak Al Nahyan, who heads UAE’s Ministry of Culture Youth and Social Development, was quoted as saying, “An outstanding government views every citizen as a natural resource,” implying that people are considered commodities. Sustainable development, which has an imprecise meaning, may in some cases lead to better policies to preserve water and soil, laudable goals to be sure. But in many cases, United Nations-style sustainable development involves top-down policies that impose costly regulations which erode private property and make land less productive, while actually harming the environment and eroding the food supply. As Yours Truly has reported on many occasions, visiting productive projects in Michigan and Texas, among other places, locally directed community gardens that produce healthy organic food, in both urban and rural settings, go a long way toward a genuine sustainable development that does not require a world authority to direct it. 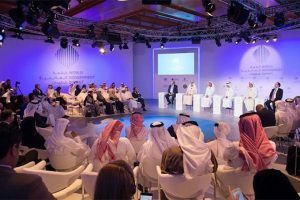 Others in Dubai were quoted as saying that governments are “the largest service providers in the world” who need the input of “the world’s greatest minds,” the narcissistic implication being that such brilliance is embodied by those professors, bureaucrats, journalists, bankers and others attending and headlining the Dubai and WEF summits. Getting into deeper essentials in Dubai, Helen Clark (pictured), the 8th director of the United Nations Development Programme and former prime minister of New Zealand, gave an address that summed up the core outlook of the summit. In so doing, she addressed certain challenges which she described as “being beyond the capacity of nation states” to resolve themselves. Her rather dry talk was not without its surprises. “We’re now for global governance,” she announced, as if full support for world governance is just now coming to the fore. 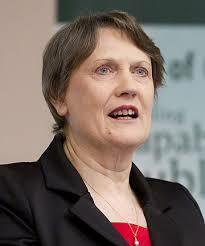 “We’re now for global governance” — UN official Helen Clark. But, as she said, the framework for world government came when the League of Nations (precursor to the UN) was formed 100 years ago, although the league, reportedly devoted to peace, failed to stop World War I. Besides, those in elite circles, like Ms. Clark, have for decades pushed for, and helped establish, de facto world government through the UN (founded in 1945) and through various other institutions. She was silent, however, on UN members like the U.S., Israel and the UK helping terrorist outfits like ISIS under the guise of fighting them (via arms shipments, official lies about the nature and goals of ISIS, etc.). Moreover, Western powers are always blaming Russia and the Syrian government—who’ve managed to put down ISIS and liberate the Syrian city of Aleppo—for much of the widespread destruction in that nation which, since 2011, has driven tens of thousands of Syrians into Europe and beyond. She concluded that “success” in implementing the UN agenda, besides presumably helping “people and planet” will have “long-term benefits . . . for the legitimacy, relevance and credibility of the multilateral system,” suggesting that this system’s legitimacy, relevance and credibility are on fragile ground. Other spokespersons in the “global governance” crowd have expressed similar sentiments in recent months. That’s largely due to more people losing their appetite for globalization and voting for Brexit (for the UK to leave the EU) and for Donald Trump as U.S. president, among other signs of people rebelling against “the rules-based world order” that, according to the one-worlders in Dubai, at Bilderberg, and at other such gatherings, is among the great wonders of the world—with its Bretton Woods-based financial system comprised of the World Bank, the IMF and world trade arrangements. But the usurious, debt-based central banking system, whose early roots include the Bank of England’s formation in 1694 and the private Federal Reserve’s in 1913, was taken to the next level at the 1944 Bretton Woods Conference that spawned these worldwide financial arrangements. And the IMF, by entangling nations in revolving-debt schemes to keep them subservient to their creditors, has become synonymous with creating poverty, yet Ms. Clark named poverty as a chief cause of the wars and conflicts that the UN system would seek to prevent or stop. So unless Ms. Clark and those of her ilk are unaware that these esteemed world-governance organizations are sometimes causing the very problems that the system’s managers say they want to solve, then they’re being highly disingenuous, at best.